Wheels Creations PVD is a leader in PVD chrome finishing, with more than 33 years of experience offering a variety of all-weather PVD chrome finishes for both customers and car dealerships, O.E.M wheel exchange services, and wheel restoration solutions. If you’re looking for quality PVD chrome wheels, feel free to partner with us. Check out our portfolio to find the best chrome finish for your needs, from the popular PVD black chrome, PVD bright chrome, PVD Onyx chrome to PVD specialty colors, which are available on a higher volume basis. With our time-tested technology and revolutionary O.E.M chrome exchange program, we’re able to offer you a wide selection of like for like PVD chrome finish wheels for your vehicle in exchange for your factory finish wheels. PVD chrome finishing and wheel restoration is our specialty. Whether you want chrome finished vintage wheels, black chrome finish for your new sports car or wheel restoration with a bright chrome finish, our PVD chroming is ideal for all weather conditions and easily protects from curbs rash and other wear and tear on your wheels. 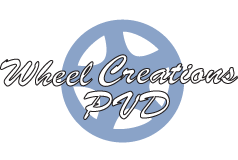 At Wheel Creations, we strive to provide our customers with the best PVD chrome wheels. Take part in our O.E.M exchange program and get the wheels you need for your vehicle now or partner with us for all your chrome finishing needs. Browse through our online portfolio to see our chrome finishing and restoration work. Our experience and capabilities at Wheel Creations enable us to provide our customers with a complete end-to-end solution for finished chrome wheels using the latest PVD technology. We deliver the right finish and restoration at the right price. As an industry-leading provider of professional PVD chrome finishing and exchange services in the U.S., you can count on us for superior and dependable PVD chrome finishing and restoration services. Check out portfolio today to find the best PVD chrome finishes for your wheels. Want to learn more about our services? Talk to us at (562) 381-2670.